"Tom is a genius in getting you to turn the road blocks into opportunity and in turning adversity into knowledge." 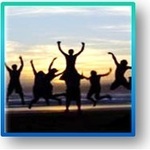 -Andrea P.
I have completely overcome ADHD being 15 years symptom and medication free! Get the ADHD MASTERY GUIDEBOOK to Learn HOW you can too!!!!! Adult ADHD/ADD Group Coaching is now open locally in Pittsburgh and globally with coaching sessions and phone coaching for an extremely affordable and ridiculously high value! If you are interested in our services please fill out the form, and we will let you know when they become available.